Ian Gibson captures the bond between a mama duck and her ducklings. One thing's for sure: a mama duck knows how to parent. Always leading her ducklings single-file, she sets an example of leadership from day one. 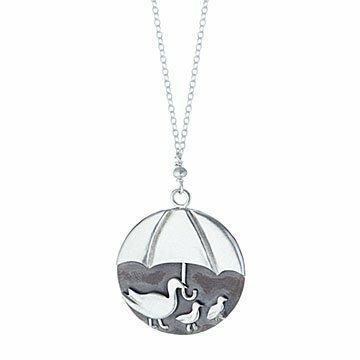 Ian Gibson epitomizes the sweetness of this mother/child bond through the whimsical design of this sterling silver necklace. This mama gives her little ones a sense of independence by letting them walk first, but shows she's still in protective mode with an oversized umbrella—because not all ducks like water off their backs. Handmade in Pennsylvania.